Stearman 65845 was built by Boeing in Wichita, Kansas in 1941 as a model A75-N1. 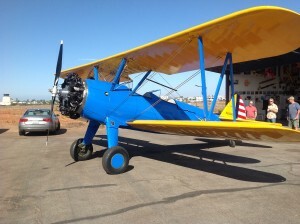 Boeing had bought Stearman Aircraft Corporation from its founder, Lloyd Stearman, who had designed the Travel Air open cockpit biplane flown by my former employers, Barnstorming Adventures. The Kaydet, as it was sometimes called, was the primary trainer for anyone who flew in World War II. Before you flew a P-51, -47, -40, -39 or -38, before you flew a Wildcat, Hellcat, Bearcat or Corsair, before you flew a B-17, -24, -25, -26 or -29, you first flew a Stearman. She is a dream to fly. She flies even prettier than she looks and she’s the prettiest airplane at Montgomery Field. (Please don’t let my Decathlon know that I wrote those words.) She has no evil flying characteristics, recovers from a stall beautifully, handles cross winds extremely well and comes equipped with shock absorbing landing gear, so it’s almost impossible to bounce her back into the air – unless you really pound her into the runway. 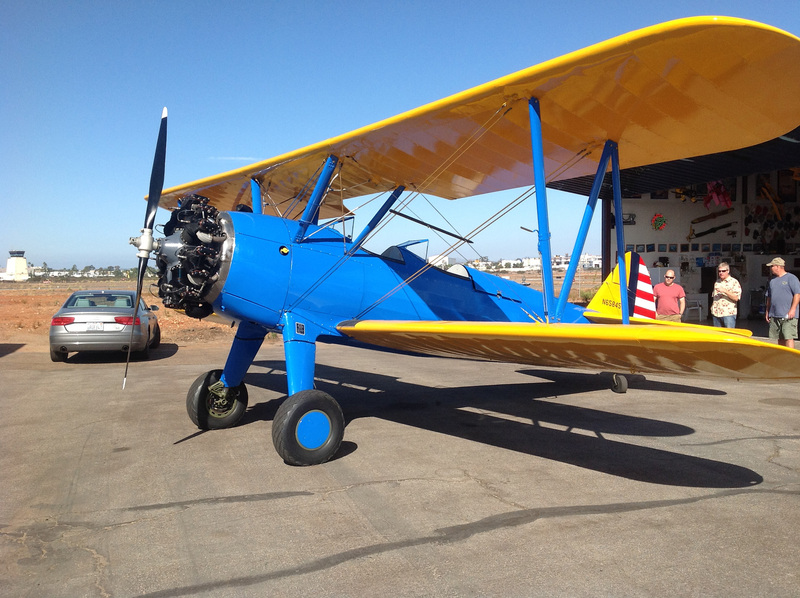 Sad to say, I’ve had to sell my share in the Stearman. The wonderful folks at Nordstrom (that’s sarcasm, in case you’re unfamiliar) decided that Laurel’s services were no longer needed after 27 loyal years of service. A Stearman becomes a luxury when the only employed person in the household is a flight instructor.